I must start this post of with the Macmillan Coffee Afternoon that Tracyann and Amelia organised last Friday - it was a brilliant afternoon and so well supported by our family and friends, EVERYONE contributed and we raised a total of £431 - Well done and thank you. Amelia has again been in good health and we have slowly introduced a sense of normality back into our lives, quite something after 3 months. Amelia attended her ballet/dance lessons on Saturday morning and managed to complete the whole session, she was buzzing after and it was great to see her so happy. Tuesday October 4th - Amelia's 7th Birthday. We have had a wonderful few days celebrating with friends and family. 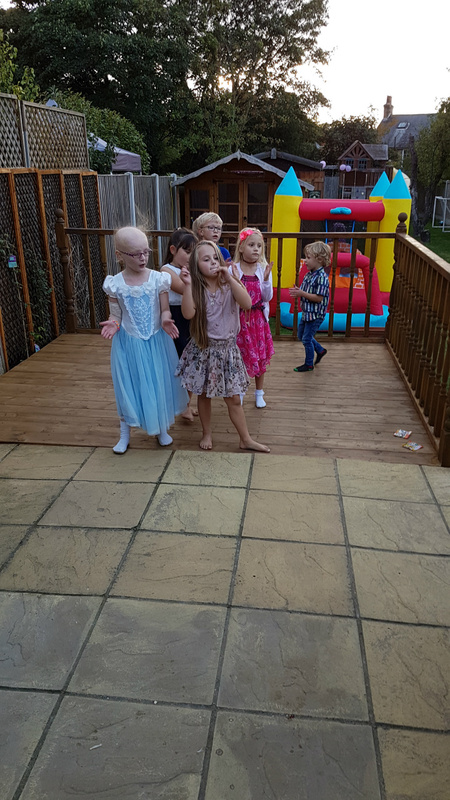 Sunday we had a little get together with family and we were entertianed by Joey The Clown, then on Monday evening Amelia had her school friends round for a garden party and what wonderful weather we had! She really has been spoilt and quite rightly so, it's been like Christmas in our house! This just proves that she is so loved by her family and friends and she means alot to alot of people. Monday and Tuesday morning Amelia attended school for the morning sessions only, a return to her school was so important to her, she loves school and again was very happy to see her peers. So it's been quite a week or so for us, tomorrow (Wednesday) is a chill day preparing for Thursday at The Royal Marsden. Thank you all for your continued support, we have an important few weeks coming up and I know you guys will be supporting us all the way - you always do.